The seller says this was manufactured in Belgium in 1944. A little hard to believe it was manufactured in Nazi occupied Belgium. Can anyone ID it and give me a little information about it? Just trying to give the seller some correct information. Thanks. Last edited by radiojwk on Mar Fri 30, 2018 4:46 pm, edited 1 time in total. Is that the name of the radio printed on the lower left hand corner of the dial? I added one more picture of the dial face. It says "Radiobell" in the lower left corner. I don't know if that is a manufacturer or a brand name. Hmmm. Radiobell model 45? 1944-45, Antwerp, Belgium. I find it very strange that it was manufactured during WWII when liberation of Belgium was not complete until February 1945. Are those miniature tubes? It looks like each of the sockets is "straddling" a larger hole in the chassis. I suppose it could have been retrofitted at a later date, but I have my doubts. It looks like late 40's at the earliest, to me. 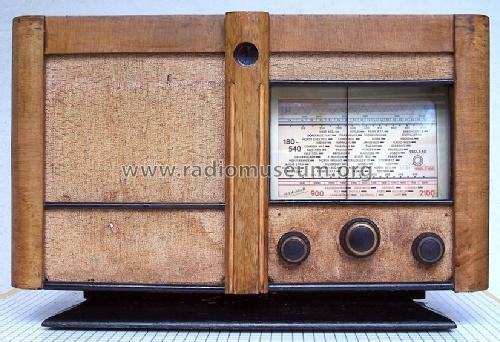 One has to remember that not all radios manufactured in Nazi-occupied Europe were Volksempfangers or other low end sets. There were higher end ones being made as well, though I don't know how many were being produced during the waning years of the war. I'd say 1945 is probably accurate. I think it’s an interesting radio. I don’t have a vintage European radio in my collection so this is one I’m interested in getting. Knowing nothing about it, can someone suggest what a reasonable price might be? The difficult part with pre-1950s European radios is that some of the tubes can be difficult to source. Couple that with overzealous shipping restrictions from ebay's global shipping program that some sellers are in love with and you'll likely have to do some serious searching if any turn out to be bad. It's a nice looking set, but know that it's one that could potentially take a while if it needs more than caps and the occasional resistor. I personally wouldn't go any higher than $100 on it. $50-$75 would be better. Thanks Tom. It’s being offered locally so shipping is not an issue. I offered $75 but have a feeling I may have insulted the seller. We’ll see. It's not a particularly good looking set, and Euro sets of that era can be a challenge to work on. Sorry the seller is insulted but I doubt there's much demand for that type of radio. I think it is an attractive cabinet, and it has a max output of 4.8 watts into a large speaker. Yes, those are unusual Philips tubes, with filament voltages of 20, 50 and 55 volts, and a 12 volt eye tube. There are radio clubs in Belgium and Holland with members that know all about that radio. I found a forum where they were discussing wartime radio. Belgians were ordered to bring their radios in to be placed in storage on April 4, 1944. So it may have been purchased just before that. Or it belonged to a Nazi collaborator. They were allowed to keep radios, and they had the money to purchase something like that one. Open the website and then Links. 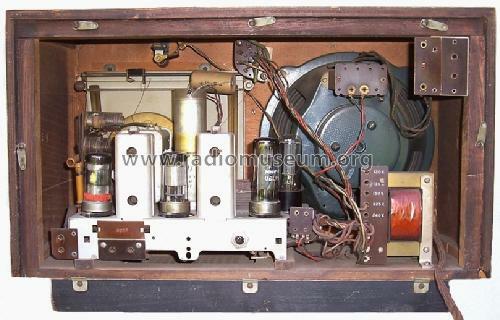 A 1950 Radiobell Standard looks like it has the same chassis. Better 40's radios, ones with transformers, go for less than £25 here. Certainly I would not expect it to make more than £50 in the UK. Apart from its association with WW2 occupied Europe it has little attraction in my opinion. But it is 'over there' and so that's in its favour. To me your $75 offer was not insulting and about right. If they're insulted, so be it. That was a fair offer. Let them keep it. So many people think they are sitting on a gold mine now thanks to those tv shows. Those tubes other than the eye tube are fairly common as they were used extensively in the late 40s and early 50s from what I have seen. Philips and Tesla used them. But only in Europe I think: unlikely to find any in the UK. Best to ask on RM.org first about typical prices. Some crazy prices for tubes on Ebay ! (Euro 70 to 100 for one I wanted). These tubes are called ¨Locktal" and were widely used in Dutch Philips sets by example.. The circuit diagrams of the radios often have the same setup,something like the American AA5 models. Tubes are easy to get here and not that expensive. Most of Belgium was liberated at the end of September ´44,together with the southern part of the Netherlands.